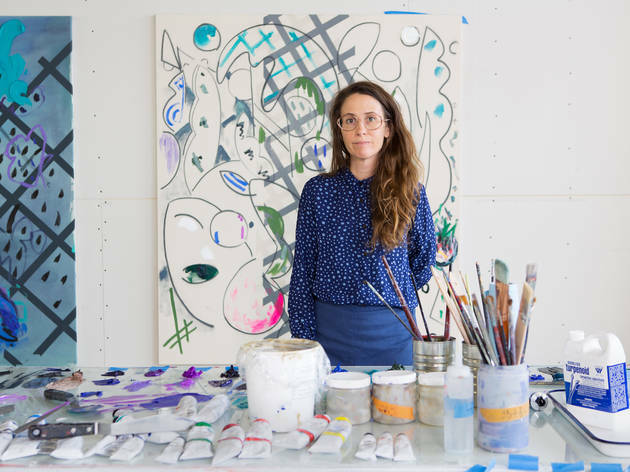 Mining the history of painting while exploring the boundaries between representation and abstraction, Laura Owens employs a diverse range of references in her eccentrically captivating paintings. Born in Euclid, Ohio, near Cleveland, Owens attended the Rhode Island School of Design and later CalArts outside of Los Angeles, where she’s remained for more than 20 years. Owens is now the subject of a highly anticipated midcareer retrospective at the Whitney, which she talks about along with finding inspiration in spam emails and Martha Stewart. I had a boyfriend who went to the Cleveland Institute of Art. So I’d go up there to see him and hang out with artists. I got into the punk-rock scene there and started to go see art shows and alternative theater. I figured that if I became an artist, I’d never get bored. Plus, I just wanted to get out of Ohio. I went to summer art camp at Interlochen where one of my teachers was also a professor at the Rhode Island School of Design. He thought I should apply and told me what my portfolio should look like. If I hadn’t gone to Interlochen, I wouldn’t have known about RISD and CalArts. I’ve heard that you do your best work between 10pm and 3am. Why is that? It’s the time when I don’t have anything else to do. You feel like you’re off the hook. Also, there’s advantages to being tired while you work. You lose your inhibitions, so decisions become easier to make. Do you consider yourself an abstract painter or a figurative painter? I sort of see everything in terms of abstraction, but you can also see what I do as documentation or realism. It’s not a binary choice. A curator once said that your work bounced between art movements, histories, styles and ideologies. Is that a fair description? I try to adopt a sort of tabula rasa when I start a painting, but I’m certainly influenced by different forms of art and non-art. I guess I have a philosophy that more is better, so all of kinds of things filter in. Well, at one point I was getting a lot spam emails and decided to start using them in a series of paintings. The same happens with my color choices. I pick up a greeting card and say, “This is my palette.” Or I go to the paint store and pick out palettes that designers use. If Martha Stewart creates a palette for Home Depot, I’ll use that. In your notes for the exhibition catalog you ask, “Why make art?” Have you found the answer? 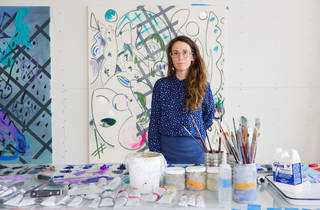 Laura Owens’s retrospective is at the Whitney Museum of American Art through Feb 4 (whitney.org).